There’s a plethora of creams and serums out there, but the latest beauty technology uses lasers, currents, lights and even radio frequency to brighten hyperpigmentation, even skin tone, and lift and tone your face. From professional services to at-home gadgets, here are the latest trending treatments to zap your way to glowing skin. We promise it’s not like electrocuting your face and it doesn’t hurt. 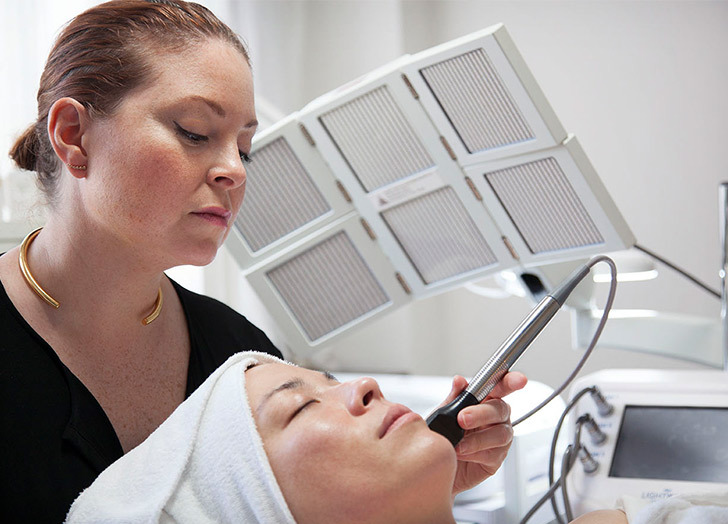 Rather, microcurrents use “a low level of electricity that mirrors the body’s own natural electrical currents,” says Molly Lamb, lead aesthetician and owner of Brooklyn skin boutique Skin by Molly. The goal is to increase collagen and elastin production and “re-educate the muscles of the face.” The treatment is best for those with sagging skin, fine lines and wrinkles, but since it also improves circulation, it may help many other skin conditions (even mild acne). You can expect to see results after just one session ($150 and up), but the real benefits come with regular sessions since the effects are cumulative, says Lamb. For an at-home version that you can use multiple times a week (and that’s slightly easier on your wallet), there’s LeBody Face. Who knew we could lift and tighten our skin while binge-watching The Great British Baking Show? In case you haven’t heard, radio is making a comeback…on your face. Radio frequency therapyis gaining traction among the skin care elite, including celebrity facialist Joanna Vargas. “Radio frequency does two major things: pushes together collagen fibers and over time increases collagen production,” says Vargas. A conductor applies noninvasive radio frequency section by section to increase collagen production and immediately tighten the skin, like an instant facelift. FDA-approved and -tested radio frequency is the signature feature of Vargas’s Forever Facial (starting at $400). You’ll see immediate results after one treatment, but—you guessed it—multiple sessions are recommended for optimal skin changes. Can clearing acne and banishing wrinkles be as easy as shining pretty colored lights on your face? LED light therapy is a proven technology that uses red and infrared light to reduce inflammation, build collagen and speed healing, says Vargas. These specific light waves give energy to your cells, increasing healthy cellular activity (which can slow as we age and are exposed to increasing amounts of sun and pollution). Treatments are known to lift, tone and improve the overall complexion for younger-looking skin, without the discomfort, down time, scarring or discoloration of other treatments like chemical peels or microdermabrasion. 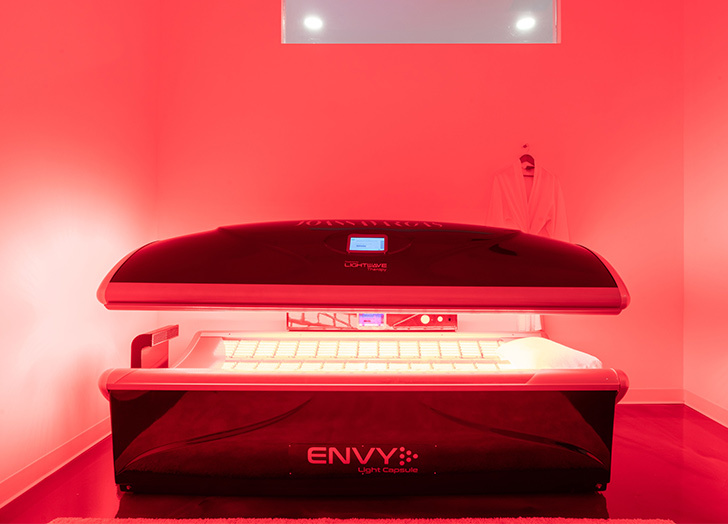 “If you’re willing to invest the time, the results are truly incredible,” says Vargas, who uses LED light therapy in her Full Body LED Light Bed treatment. Can’t make a trip to a pro’s office or shell out for multiple sessions? The uber-popular at-home tools from QuasarMD are beloved by mega beauty celebs Huda Kattan and Kim Kardashian. We all know lasers are a great way to keep cats entertained, but laser therapy is great for redness, prominent blood vessels and hyperpigmentation. Dr. Paul Jarrod Frank, cosmetic dermatologist and founder of the PFRANKMD Skin Salon, says that lasers can help a range of issues, including sun damage and acne scars. They’re also great for skin types that can’t tolerate harsh topical treatments. Dr. Frank uses lasers in his Pigment Protocol, a noninvasive, painless skin treatment that breaks up discolored areas and improves texture with minimal downtime (starting at $1,000). Depending on the type of laser treatment, you may require topical anesthesia, but some don’t need any anesthesia at all. (Same goes for down time—it all depends on the intensity of the treatment.) Because laser treatment relies on the body’s ability to heal, it can take anywhere fromone to four weeks before you start to see a significant difference. “It’s important to see a provider that has several types of laser options, not just one, so you can best identify the type that works best for your needs,” says Dr. Frank. Laser treatments range from $200 to $5,000.